"Inspired by Panera Bread's version, this soup delivers on flavor. Tender chicken in a lemony broth with orzo pasta, carrots, onions, celery, and baby spinach. 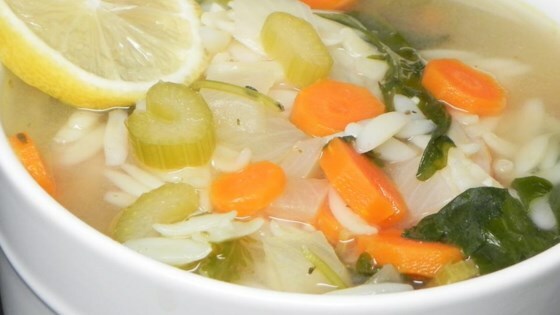 This has quickly become one of my family's very favorite soup recipes." Bring the broth to a boil. Partially cover the pot, reduce heat to medium-low, and simmer until the vegetables are just tender, about 10 minutes. Stir orzo, lemon juice, and lemon zest into the broth; add chicken. Cook until the chicken and orzo are heated through, about 5 minutes. Add baby spinach; cook until the spinach wilts into the broth and the orzo is tender, 2 to 3 minutes. Ladle soup into bowls; garnish with lemon slices and Parmesan cheese. Wonderful soup. Only change was to keep the orzo and soup separate as I planned on eating this over several days and didn't want the orzo to absorb all the broth. Why would you cook the chicken first? Add the raw chicken to give the store bought broth more flavor. Make sure the chicken is cooked before serving.